Learning would be exceedingly laborious, not to mention hazardous, if people had to rely solely on the effects of their own actions to inform them what to do. Fortunately, most human behavior is learned observationally through modeling : from observi. We find that people's beliefs about their efficacy affect the sorts of choices they make in very significant ways. In particular, it affects their levels of motivation and perseverance in the face of obstacles. 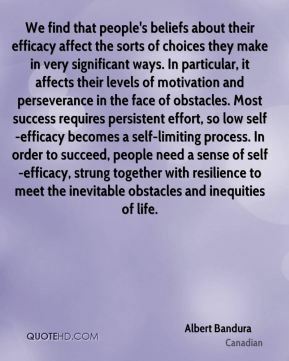 Most success requires persistent effort, so low self-efficacy becomes a self-limiting process. In order to succeed, people need a sense of self-efficacy, strung together with resilience to meet the inevitable obstacles and inequities of life. Even the self-assured will raise their perceived self-efficacy if models teach them better ways of doing things. 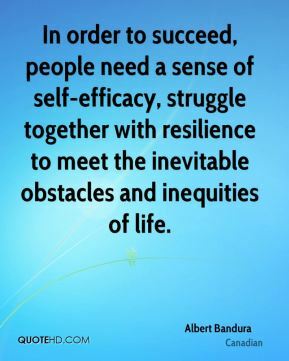 In order to succeed, people need a sense of self-efficacy, struggle together with resilience to meet the inevitable obstacles and inequities of life. 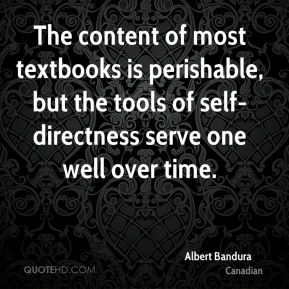 The content of most textbooks is perishable, but the tools of self-directness serve one well over time. 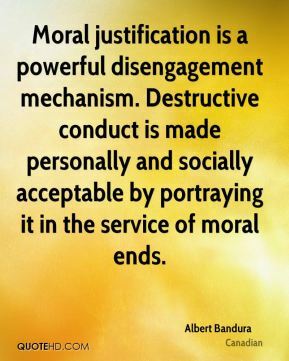 Moral justification is a powerful disengagement mechanism. Destructive conduct is made personally and socially acceptable by portraying it in the service of moral ends. 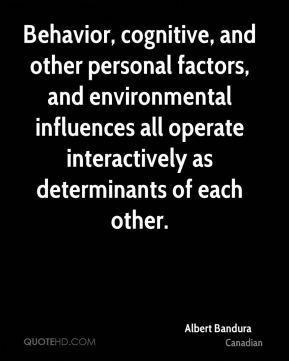 Behavior, cognitive, and other personal factors, and environmental influences all operate interactively as determinants of each other. 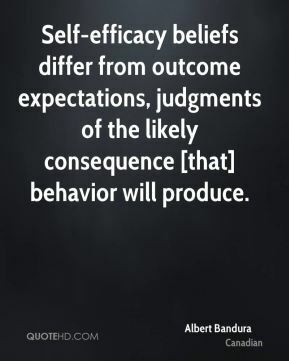 Self-efficacy beliefs differ from outcome expectations, judgments of the likely consequence [that] behavior will produce. This has increased with the tremendous technological advances in communications. We have a vast new world of images brought into our sitting rooms electronically. Most of the images of reality on which we base our actions are really based on vicarious experience. This has increased with the tremendous technological advances in communications. 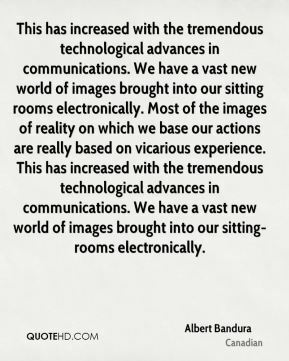 We have a vast new world of images brought into our sitting-rooms electronically. 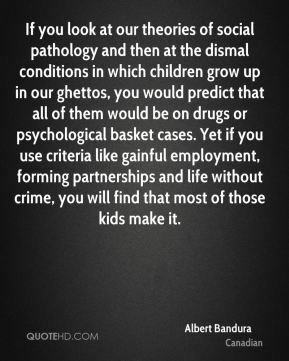 If you look at our theories of social pathology and then at the dismal conditions in which children grow up in our ghettos, you would predict that all of them would be on drugs or psychological basket cases. Yet if you use criteria like gainful employment, forming partnerships and life without crime, you will find that most of those kids make it. 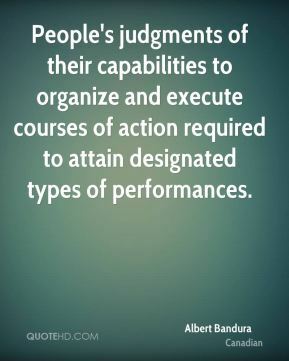 People's judgments of their capabilities to organize and execute courses of action required to attain designated types of performances. 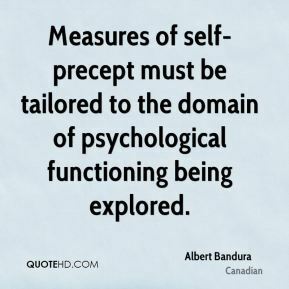 Measures of self-precept must be tailored to the domain of psychological functioning being explored. 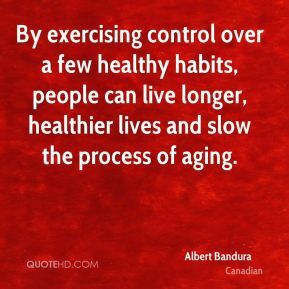 By exercising control over a few healthy habits, people can live longer, healthier lives and slow the process of aging. 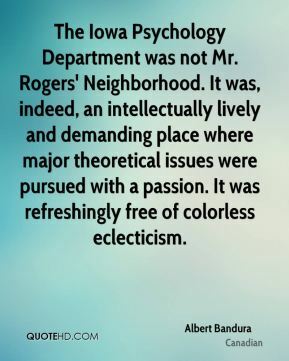 The Iowa Psychology Department was not Mr. Rogers' Neighborhood. It was, indeed, an intellectually lively and demanding place where major theoretical issues were pursued with a passion. It was refreshingly free of colorless eclecticism.